With three days left in early voting and Election Day on Tuesday, Nov. 6, this midterm election is nearing history. And Walker County voters are making history with the commissioner referendum, regardless of which way they vote. With the Republican, Democratic, and Tea parties all united behind the change from sole commissioner to a board of commissions, the referendum is expected to pass, with some political pundits saying by as much as 60% or better. But the ballot box may tell another tale. The Georgia gubernatorial race is different, however, with most polls and pundits calling it a dead heat between Democrat Stacey Abrams and Republican Brian Kemp (the current secretary of state). With these popular and hot issues on the ballot, local election officials have already seen near-record early voting and expect that pace to continue through Election Day. These issues make voting in this midterm extremely important. elections for all voters. The fact is that it has never been easier to register to vote and get engaged in the electoral process in Georgia, and we are incredibly proud to report this new record." Locally, Walker County has 38,600 active registered voters, according to the county election commission, up over 5,000 voters from the 32,951 registered voters in the 2016 general election. The election commission lists registered voters by precinct as follows: LaFayette-5,802, Walnut Grove-1,886, Rock Spring-5,775, Armuchee Valley-1,222, Mountain-1,070, Chattanooga Valley-5,817, Kensington-1,333, Rossville-5,600, Chickamauga-6,168, Fairyland-1,220, and Fairview-2,704. Early voting continues in Walker County through Friday, Nov. 2, at five locations: the courthouse downtown, Chickamauga Civic Center, Georgia Northwestern Technical College, Lookout Mountain City Hall, and the Rossville Municipal Civic Center. Poll hours are 8:30 a.m. to 4:30 p.m. through Friday. On Election Day, Tuesday, Nov. 6, poll hours are also 7 a.m. to 7 p.m. at all precincts. All voters are required to present an acceptable ID at the poll for either early voting or on Nov. 6. This may be a valid state or federal government issued photo ID, including a free ID Card issued by your county registrar's office or the Georgia Department of Driver Services (DDS); a Georgia driver's license, even if expired; a valid employee photo ID from any branch, department, agency, or entity of the U.S. Government, Georgia, or any county, municipality, board, authority or other entity of this state; a valid U.S. passport ID; a valid U.S. military photo ID; or a valid tribal photo ID. Fairview: VFW, 98 Memorial Drive, Rossville. Walker Launch students talk with visitors during their lunch break. Walker County Schools Superintendent Damon Raines prepares to cut the ribbon for the Walker Launch career academy on the Rock Spring campus of Georgia Northwestern Technical College as visitors and Launch students watch. Walker County Schools and Georgia Northwestern Technical College saw the full support of its community Tuesday, Oct. 23, as the new academy, "Walker Launch," held a ribbon-cutting. Several dozen administrators and instructors from both educational outlets, as well as business and community leaders from across Walker County were on hand for the ceremony. GNTC President Pete McDonald praised the Launch concept, saying "How fantastic this program is. ... Demand and salary for skilled workers are phenomenal, and our mission is workforce development and preparation." He noted that through a HOPE career grant students' total tuition is paid by HOPE. Walker County Schools Superintendent Damon Raines added, "Walker Launch is an exciting, promising program about teaching the future of Walker County to live smarter; to avoid a lifestyle which forces so many families to live paycheck-to-paycheck." More than two dozen students from both LaFayette and Ridgeland high schools in Walker County are enrolled in the pilot year of Walker Launch. The students began attending dual-enrollment high school and college courses on the Walker County campus of GNTC in August. Students can choose career pathways in machine tool technology, automotive technology, air-conditioning technology, welding and joint technology, logistics and supply chain, networking specialist, health information technology, web site design/development, accounting, and drafting technology. employee relations, responsibility, and more. Along with their instructors, students have personal a personal mentor/coach working with them weekly. The program is designed to offer specialized skilled training to prepare area students to master an essential skill and to "graduate more kids to come back to Walker County" and help grow existing and new industries looking to locate here, explained Raines. "Our hope is to help students get into high-demand jobs," said Raines. "We are training these young men and women for careers in everything from health care to logistics," he said. "Industry is looking and begging for workers with job skills," echoed Julie Portwood, mission support specialist. She explained that all Launch students take the basic high school core classes and meet all entrance criteria set by GNTC. "We push these students, and they have risen to the occasion," she said. Walker County Schools administration hopes to see the enrollment of the new Launch career academy expand to 200 students in the near future. For more information about the program, students and families can speak with the guidance counselor's office at their high school. Students interested in joining the program will be required to apply to enroll in Walker Launch, as well as meet certain program guidelines. Among those in attendance at the ribbon-cutting held in the 500 Building on the Walker County campus of GNTC were Raines, McDonald, Walker County Schools Coordinator of Innovation Matt Harris, Walker County Sheriff Steve Wilson, Walker County Commissioner Shannon Whitfield, Walker County School Board Member Karen Stoker, along with nearly two dozen other officials and business and leaders from Northwest Georgia. Georgia Northwestern Technical College provides quality workforce education to the citizens of Northwest Georgia. Students have the opportunity to earn an associate degree, diploma, or a certificate in business, health, industrial, or public service career paths. This past year, 16,402 people benefited from GNTC's credit and noncredit programs. With an annual credit enrollment of 7,750 students, GNTC is the largest college in Northwest Georgia. GNTC has an additional enrollment of 8,652 people through adult education, continuing education, business and industry training, and Georgia Quick Start. GNTC is a unit of the Technical College System of Georgia and an Equal Opportunity Institution. Susan Wells, recipient of the 2018 Walker County Citizen of the Year award, stands with her husband David Wells, daughter Elizabeth Wells and mother Jean McCoy. Susan Wells received the Citizen of the Year award Saturday, Oct. 20, from the Walker County Chamber of Commerce. The honor was presented during the Chamber's annual fall Gala, a black-tie event held at the Fairyland Club on Lookout Mountain. Wells is a lifelong educator, family and children's advocate and volunteer. She is a native of Rossville, the daughter of Bob and Jean McCoy, and a Rossville High School graduate. She received a bachelor's degree in education from the University of Georgia, her master's degree in education from the University of Tennessee at Chattanooga, and her education specialist degree from Jacksonville State University. board, won, and served as chairperson during her term. Throughout her life, she has been an advocate for families and children in Northwest Georgia and is currently coordinator of Walker County Family Connection, a position she has held for 12 years. Her dedicated volunteerism stretches over 40 years. She has been a lifelong member of several local Methodist churches and is currently serving as the chair of the North Georgia Holston GAP Staff Parish Relations Committee. She has been married for 37 years to David Wells and is the mother of twin daughters, Dr. Katie Wells and Elizabeth Wells. She was selected from nominations that were reviewed by a committee of residents from each of the four cities in the county, a past recipient of the award, and volunteers from the Chamber membership. 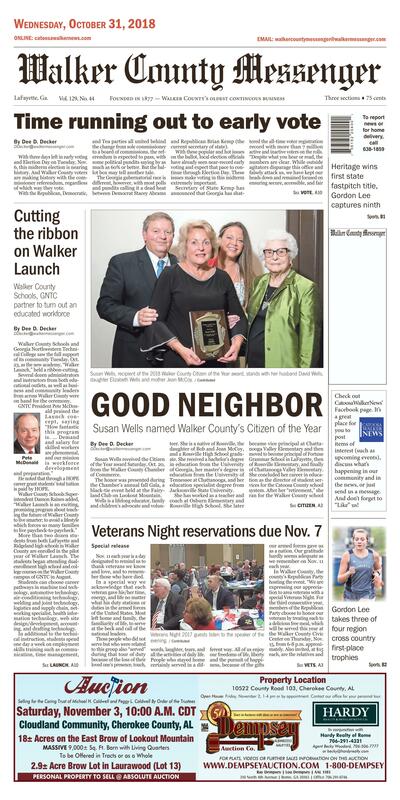 The recipient is selected based on volunteer contributions to Walker County. A new selection committee is appointed each year. Former Citizens of the Year honorees include: 2017, Helen Gamble; 2016, Marilyn Ransom; 2015, Eddie Upshaw; 2014, Jim Smith; 2013, Thomas Harrison; 2012, Jeff Mullis; 2011, Nelda Parrish; 2010, Chip Catlett; 2009, Belva Gilbert; 2008, Bebe Heiskell; 2007, J. Farrell Brown; 2006, Charles "Dino" Richardson; 2005, Ben Napier; 2004, Steve Wilson; 2003, Willie A. Haselrig; 2002, David Ashburn; 2001, Mike Bunn; 2000, Sanford E. Leake, Sr.; 1999, Buddy Chapman; 1998, Katherine C. Derrick; 1997, Dr. Robert Jones; 1996, Ray Brooks; 1995, Clara Marsh; 1994, Louise M. Smith; 1993, Ronnie Holden; 1992, Albert D. Millard; 1991, Russell Friberg; 1990, John J. Shadden, Jr.; 1989, Betty Jo Campbell; 1988, Charles R. Lusk; 1987, W. Leonard Fant; 1986, J. Frank Cobb; 1985, Fred B. Henry; 1984, Doris W. White; and 1983, Roy E. Parrish. Veterans Night 2017 guests listen to the speaker of the evening. Veterans and their guests enjoy the buffet at last year's Veterans Night. Nov. 11 each year is a day designated to remind us to thank veterans we know and love, and to remember those who have died. In a special way we acknowledge that each veteran gave his/her time, energy, and life no matter what his duty stations or duties in the armed forces of the United States. Most left home and family, the familiarity of life, to serve at the beck and call of the national leaders. Those people who did not serve but who were related to this group also "served" during that tour of duty because of the loss of their loved one's presence, touch, words, laughter, tears, and all the activities of daily life. People who stayed home certainly served in a different way. All of us enjoy our freedoms of life, liberty and the pursuit of happiness, because of the gifts our armed forces gave us as a nation. Our gratitude hardly seems adequate as we remember on Nov. 11 each year. friends of our veterans. A reservation must be received by Nov. 7 for each participant. This special dinner is open to all no matter the political affiliation of the veteran. There will be feasting, singing, praying, dancing by a troupe of college girls, laughter, and story telling. Friendship and thankfulness are the watch words." Two special speakers have agreed to share their thoughts. Brian Hart, a local hero, who was an engineer in the Army, and Boyd Lackey, a resident of a nearby town who was a chaplain in the Army, will each speak briefly. Both men served 30 years, and each will present a different picture of life through his service. To reserve a Veterans Night place for yourself and your family, call 423-364-5682 before Nov. 7.